Summary from Goodreads: "Time travel” — and its hazards—are made literal in this astonishing new novel in which a recklessly idealistic girl dares to test the perimeters of her tightly controlled (future) world and is punished by being sent back in time to a region of North America — “Wainscotia, Wisconsin”—that existed eighty years before. Cast adrift in time in this idyllic Midwestern town she is set upon a course of “rehabilitation”—but cannot resist falling in love with a fellow exile and questioning the constrains of the Wainscotia world with results that are both devastating and liberating. I am well aware that Joyce Carol Oates is not every reader's cup of tea. I happen to find her brilliant. I have read 18 of her books. I know people who feel as I do about her and I feel friendly towards those people. So I am not so much recommending this novel to any but those JCO lovers. I am wanting to share my thoughts with my JCO tribe. Ms Oates, as far as I know, had not gone in a post apocalyptic/dystopian direction before. I know she likes to try new things and doesn't worry if she comes out on top of any specific genre. It is exciting to see how she goes about putting her own stamp on whatever she attempts. In the novels and stories of hers I have read so far, the thing she always, always does is explore emotional and psychological trauma. Hazards of Time Travel follows a female high school senior who has grown up in a future, extremely tightly controlled society. She dares to think for herself in the Valedictorian talk she will give at graduation. Her punishment is banishment to an earlier time, loss of her family and even her own name. Despite her intelligence and daring, she has been so impregnated with the concepts of her upbringing that her resulting fears never leave her. She is not ever going to be free, whether she stays in 1950s Wisconsin or is allowed to return to her own time and place. All the details are exactly right. I would not expect anything less. But those details are not just used to orient the reader in the story. They are used to show that the details of daily life, the details of behavioral control, mind control, the details of love and loss, are the very things that keep us trapped, alone, depressed and fearful. Then there are some odd sentence structures. For me those sentences put me in the minds of the characters. We don't think in carefully constructed sentences, do we? We certainly don't feel emotion in them. Brilliant! 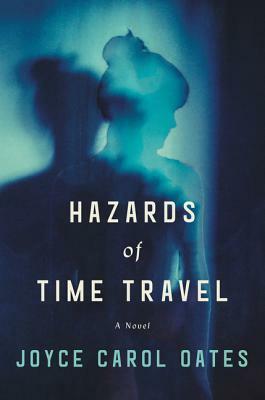 Hazards of Time Travel seems like a Trump timely novel but, according to Ron Charles in his Washington Post review, JCO had started the novel in 2011 and finished it before the 2016 election. I like to think of novelists as our modern day prophets. This book is an example of that. Yup. Gets me every time. I've been digging into her work. I've never read anything by her but I think I'll start with her first book (now added to my Amazon Wish List). Thanks! I've been wondering about this author because she appears a lot on my Amazon cartwheel. Most times the blurbs do not appeal to me, but I see her books pop up so often that I've started to get curious enough. ;-) I'm glad she is one author that, for you, always delivers. She writes about tough stuff. She does so very well. Oh my, she sure is! I'm always impressed with how many novels JCO churns out!! She's such a prolific writer!! I've only read one book by JCO titled, The Female of the Species - This book contained very dark stories. I've wanted to read more of her works, but have felt overwhelmed as to where to start next. I tried We Were The Mulvaneys and didn't like it. Which one would you recommend me to try again? Hm. We Were the Mulvaneys was supposed to be her most accessible novel. It is one I have not read. Perhaps you could try Hazards of Time Travel. Lately when I read a new (to me) author who has written lots of books and find his or her latest novel good, I just go read the one published right before the one I read. I can't claim to be a huge Oates fan, although I have read three (I think) of her books and enjoyed them several years ago. I haven't actually read any of her recent stuff but the reviews of this one - including yours - sound intriguing. I think I may get to it one of these days. I would be curious to know how you find it. I've been meaning to read moreTime Travel novels, this sounds like a good one! I find it wondrous and amazing how many different approaches there are to time travel in fiction!